I’m full of random stuff today. And in a surprisingly good mood for it still being before noon. I’m warning you, I’m completely random. At 2am this morning I seriously thought to myself, “I’m more likely to sing Russian opera than fall back asleep.” I’m happy to report I was wrong. I’m constantly confused by bloggers who write about photography but include no photos. I don’t want to read about it – show me. I’m a visual person. Otherwise I wouldn’t have even clicked on the topic. For reals, yo. As a matter of fact, I rarely stick around blogs that don’t use photos at all. Like I said, visual person. What? Can’t a girl enjoy books with big pictures? Watching the BDD attack bubbles is the best thing since sliced bread. Until she eats the bubble wand. Mel made [and photographed] this cake. And I want it. I apologize in advance for making you drool. Imagine what that bullet would have been like without the photo. Now imagine reading instructions on how to use the rule of thirds without an example photo. I know. Both are pointless. I don’t know why PodMate keeps giving me her Easter candy. First it was Starburst Jellybeans [that the office generously helped consume] and now it’s Reese’s Peanut Butter Eggs. I think she may have a fever so I’ll just act like my drawer is a safe deposit box for now. Satin pajamas. I’m not sure what to think of them. I managed not to slip off the bed while wearing them so that’s a good start. Chase has zero will power. 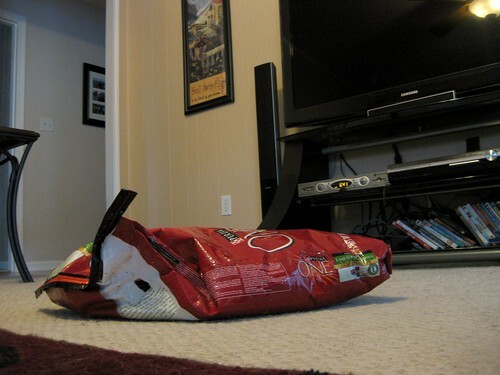 I came home to find a 20 pound bag of dog food dragged from the kitchen to the living room. Yes, there was a hole in it. But I never realized Chase was Herculean. Either that or she grew thumbs while we were at work. Hasn’t Ricky Martin been denying for years if he was straight or gay? So this should really be no surprise, right? I’m not surprised. And I’m usually surprised. But I’m not. So what’s the big deal? Flex Weeks are absolutely fabulous. Forty hours in four days… I love you, Free Friday. I warned you. Completely random. 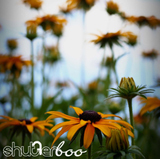 ~ by shutterboo on March 30, 2010. -Dude, that is one strong (or highly motivated) dog. -For your own safety, please don’t combine the satin pajamas with satin sheets. You may not use photos but I follow you on flickr – it works enough for me. I’m impressed by the dog food bag dragging skills. Clyde TRIES to open the dog food bags if I leave them in his reach, but he’s just too little and gets tuckered out before he gets anything. Bonnie doesn’t bother but she’s only got like 5 teeth. I think she knows the limits of her bag ripping abilities. She really wanted it. She only had about 5 pounds on the bag of food too. That’s a lot of tugging. I’ll have to find the photos of the White Castle boxes. That was comedy. That is a freakin’ AWESOME cake! Your pic captures the AWESOMENESS perfectly… and your friend’s blog with the bourbon cupcakes… more awesomeness! and no article in the world would have been able to portray the awesomeness without a picture!! That’s Mel’s photograph – she makes fantastic cakes (they look amazing and taste even more amazing). 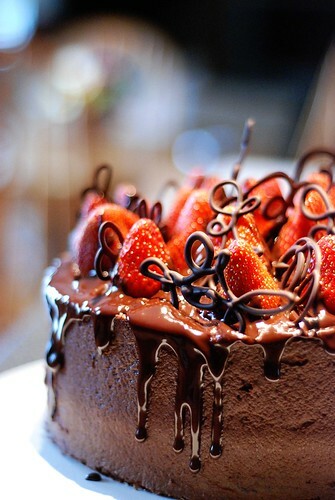 She’s done a great job photographing all her cakes so I recommend visiting her blog to see more: Splendid Sweets.